Çelebi, a global brand and embedded in the Turkish aviation sector, maintains its growth trajectory. 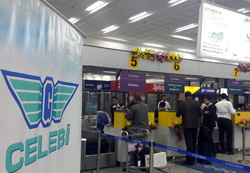 Çelebi opened its latest station abroad in India where it already provided services in Delhi and Mumbai airports. 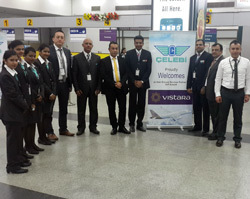 Çelebi started its operations at Ahmedabad with the comprehensive services it provided for flights of Vistara, one of the youngest airlines in India, on 10 December 2015. This service of Çelebi constituted a significant first in Indian civil aviation history. “Providing both ramp and terminal services for a local airline company as a ground handler”, Çelebi blazed a trail in Indian aviation history. 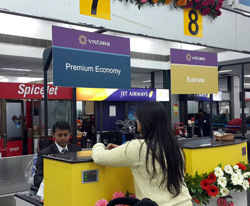 Çelebi provides comprehensive services for Vistara in Mumbai as well as Ahmedabad. Starting operations at Ahmedabad, one of the most important airports of India, Çelebi increased number of its stations, where it provides ground handling and/or cargo & warehouse services, to 6 abroad, and 37 in total. Deeply-rooted brand of Turkish aviation sector, Çelebi maintains its sound growth in global arena by its ‘quality service at high standards’ approach. Global brand of Turkey, Çelebi, added another important link to its service chain abroad. As well as 31 airports in Turkey, Çelebi provides services in Budapest-Hungary, Vienna-Austria, Frankfurt-Germany, and Delhi and Mumbai airports in India. And Çelebi now commences operations in Ahmedabad with the comprehensive service it provides for Vistara airlines on 10 December. Thus, Çelebi increases number of airports which it provides services to 6 abroad, and 37 in total. The start of Çelebi’s operations in Ahmedabad Airport, the first service it provided for Vistara, also became a significant turning point for Indian civil aviation history. With the service it provides for India’s young airline company Vistara, which is a partnership of TATA and Singapore Airlines, Çelebi blazed a trail and made history in Indian aviation sector by providing both ramp and terminal services to a local airline company as a ground handler”. Ahmedabad Airport (Sardar Patel Vallabhbhai International Airport), one of the important airports of India, provides cargo services as well as national and international flights. Çelebi targets to extend its cooperation with domestic airline company Vistara to other airports of India which Vistara flies to, especially GOA and Pune as well as Ahmedabad and Mumbai. Stating that Çelebi extended its pioneering mission in the national arena to international area by its strong growth in the global market, Çelebi Aviation Holding Chairman said, “India is a challenging market, but it also harbours significant potential. As Çelebi, we became a source of reference with our state of the art technology, modern equipment and contemporary infrastructure when we started our operations in Delhi and Mumbai in India yesterday. And today, with our first in Indian civil aviation history, we continue to be a source of reference also in the international arena. Emphasizing that they strongly maintain Çelebi’s growth strategy in national and international markets, Çelebi Aviation Holding CEO Onno Boots said, “When you look at Çelebi’s 57 years of history, you see an endeavouring, unwavering corporation which turns challenges into success, and takes strong and right steps. As we stated before, our focal points are those which harbour potential and are open to progress. Earning more prestige each day in national and international arena, Çelebi maintains its growth thanks to such strong, brave and healthy steps. Ahmedabad has been the last link of Çelebi’s supreme service chain offerings.” Çelebi will continue its growth and progress in the global arena as well as domestically, added Boots. Çelebi offers ground handling and cargo & warehouse services at 6 airports abroad and 37 airports in total. It provides ground handling services at 31 airports in Turkey, and Budapest-Hungary, Vienna-Austria, and Delhi, Mumbai, and Ahmedabad airports in India. Çelebi also carries out cargo & warehouse services at Istanbul-Turkey, Budapest-Hungary, Frankfurt-Germany, and Delhi-India airports.